The first to post was Joy, in New South Wales on the eastern coast of Australia. (It was still Saturday over here.) She found a peanut worm! And more: see Between a Rock and a Sandy Place. Kate St. John, of Outside my Window, was pleased not to find a tunnel-maker. Really. A blue spotted salamander! Rebecca bent the rules a bit, to good effect. Bill, at Fertanish Chatter says "termites were a popular find..." And the millipedes are pretty. Go see what else he turned up. Cindy's finds were in black and white. Under the Rocks This Morning at Bug Safari. on Wild About Ants, she allows an ant to bite her. And gets bitten by one she didn't give permission to. 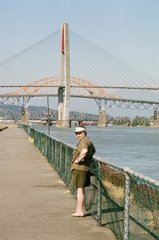 Margy, blogging on Powell River Books Blog, wonders what that blue thing says about her beach. 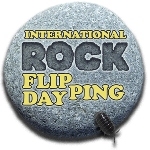 Martha, aka Upupaepops, shares a poem by Robert Browning, in Getting Dirty on International Rock Flipping Day. Eileen, at Cicero Sings, reports on invertebrates that seemingly have moved north, with the warmer winters. IRFD has rolled round again. Dave Bonta limits himself to two rocks, and finds ... go see! In the Halls of the Mountain Cricket. UPDATE: Canniness, cowardice, or flipping fraud? That is the question Lynda at Mainly Mongoose asks. But the "fraud" netted her a crowd of hungry lizards; go see for yourself. And Susan, blogging at Chicken Spaghetti, has an introductory post on her blog, and a series of photos in the Flickr group. Cute froggies! UPDATE #2 & 3: My posts; Between a rock and a dry place, and Water makes all the difference. @microecos reports "A little light rock flipping in the early PM: annelids, planarians, isopods, chilopods, slugs, snails, ants, springtails", but so far, hasn't put up a blog post. UPDATE: His post is "Flippant", but packed with goodies. Jenny, with her 4- and 6-year-old daughters got wet and muddy and mosquito-bitten in a creek bed. Such fun! The Science Goddess had to resort to flipping a birdbath. See What It's Like on the Inside for details. CabinGirl didn't just bend the rules; she made pretzels out of one. But she found a beautiful Banded Tussock Moth Caterpillar, so I'll waive the (nonexistent, anyhow) penalties. Several of these posters added their photos to the Flickr group, as well. And this one; how do I categorize it? It's a blog post, but it's fiction. Or is it? You be the judge; here's Hugh's fictional character, the Interpreter, Flipping Rocks. There will be more. Several people have mentioned their plans to flip, but haven't done a blog post yet. I'll add the links as they come in, so do check back to see them. Thanks, Neil. I was wondering about the planarian!